Yesterday, my son-in-law took my 7 year old grandson to the hospital due to a persistant headache that he had all week that was getting worse (migraines run in their family). From there, he was taken via ambulance to a children's hospital in Orlando, FL. After testing, they diagnosed him with, what they originally called, a cystic tumor on his brain. The oncologist is now backtracking on that a little bit, and saying that they won't know for certain what it is until they can remove it. 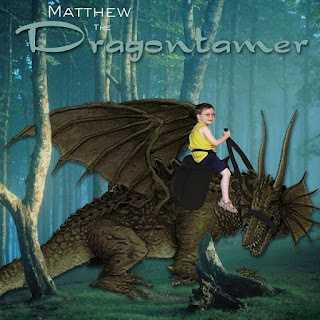 Digiscrap page I did for Matthew a couple of years ago - He has a new "dragon" now! Matthew will be having surgery tomorrow to remove the tumor. I would appreciate any prayers or positive thoughts that could be sent his (and his family's) way. Kids are pretty resilient, and I'm sure he can bounce back quickly - once the doctors have done what they need to do, but I know that the worry and the waiting is taking a major emotional toll on my stepdaughter, as well as the rest of his siblings (Not to mention those of us who are so far away and feel helpless!). **UPDATE @ 5/8/12 - Tests this morning confirmed that the surgeon did a terrific job and removed all of Matthew's tumor during surgery yesterday. Other than that, his stepdad says that Matthew is struggling with pain and nausea. We are still waiting for the pathology report. Thank you for your continued prayers! Vielen Dank Tina! Ich schätze es sehr. Vielen Dank für ihre Kommentare als gut! Matthew will definitely be in our family's prayers....for as long as it takes...as will your whole family. In fact, I'll do a trade with you.....we are praying, and fasting, for our youngest grandchild, 17 months old Millie. She's just getting over a bad case of chicken pox, and she's now showing symptoms of Acute Cerebellar Ataxia. The doctors say they have not seen this in such a young child. She may recover within 2 weeks, but they won't know how much damage may have been done until the 2 weeks are up. Anne-Marie, We're adding little Millie to our prayers, also. God will keep her in His powerful and comforting hands. You have my prayers. I am sure he will be ok but you must be beside yourself. I'll be thinking of you and your grandson. Thinking of you Sara and sending lots of positive energy! My thoughts and prayers are with you and family for your grandson! Take care, hugs! Big hugs coming your way. Praying nonstop for you, your grandson and family. It's obviously a time right now...my mom was just diagnosed with cancer of the kidney. she goes in next week for removal. So, I'm already in the zone. Hello Sara, i am so sorry you have this worry. My prayers will be with you all, and i hope Matthew will be well soon. Absolutely Sara! I so hate to hear about little children who are ill. Prayers are coming! I will keep you grandson and family in my prayers. Hugs and prayers for the children and their families. Sara, Your grandson and the entire family are in my thoughts and prayers. It is so especially hard to understand these things happen when they happen to the very young - especially when they happen to your grandson. My prayers are with you, Sara, and your Grandson, Matthew. I certainly understand how you feel as my granddaughter had Kawasaki disease when she was 7 years old. That was quite an experience, but praise God, she is just fine now and 14 years old! What God can do for one He can do for another, and I am praying for COMPLETE HEALING for Matthew. Please keep in touch with us and let us know how he progresses! Bless you and your family, I hope Matthew is soon on the road to full recovery. Keeoing your family in my prayers. thanks for keeping us updated so well with all that you've got going on. You and Matthew are constantly in my thoughts. lots and lots of prayers for healing and a positive pathology report!!! God bless you and your family. My Mom, too, had a brain tumor and I know how tough it is on everyone. Offering many, many prayers. Hang in there. Bless him- will keep him and the family in prayers- can you send me an address to mail out a card??? My 5 yr old nephew had a kidney tumor last year- chemo and radiation and the whole 9 yards- he is doing so well right now...but loved all of the cards in the mail.